West San Jose has not been getting a lot of attention lately when it comes to major development projects--especially when compared to Downtown and North San Jose. 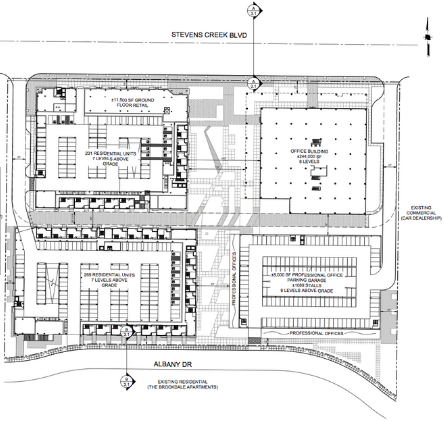 Developer FortBay LLC is stepping up to the plate and is proposing a 244,000 SQFT office complex along with 500 apartments at Stevens Creek and Lopina Way. That would been enough space for 1,500 jobs in West San Jose, allowing more residential to be built without contributing to our current jobs/housing imbalance. The apartments would be built in two six-story buildings, the office would be in a separate six-story building, and there would be a six-story garage to handle the parking. It looks like the developers are a fan of buildings with six levels. Unfortunately it does not sound like there is a retail component. Right now the area is not permitted for residential, so the developer is hoping to get "signature project" status which would given them a bit of leeway here. Combining office and residential into an urban village makes a lot of sense from a logistics and parking perspective, so I hope this goes through.